This article walks through practical measurement of a ferrite toroidal inductor using an antenna analyser. To be relevant practically, lets use an example from N4SPP’s end fed wire antenna on 3.6MHz. His coupling transformer uses a two turn winding on an FT240-43 core for the nominal 50Ω connection to the antenna system. 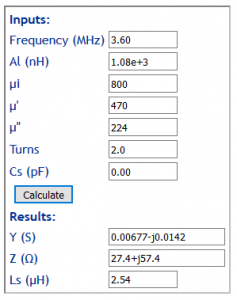 We could calculate the impedance of this winding using one of the plethora of online and desktop inductance calculators, but lets first fetch the data from the manufacturer. A simple statistic that is widely used is Al, and above, Fair-rite gives Al=1075nH +/-20%. Note that although they give a tolerance of +/-20%, it is not uncommon that manufactured product has greater error, they may have optimistically quoted the standard deviation and it is easy to fall outside that (37% chance). What might we expect. Let’s check that the likely measurements will be in-range of the type of instrument that we will use. 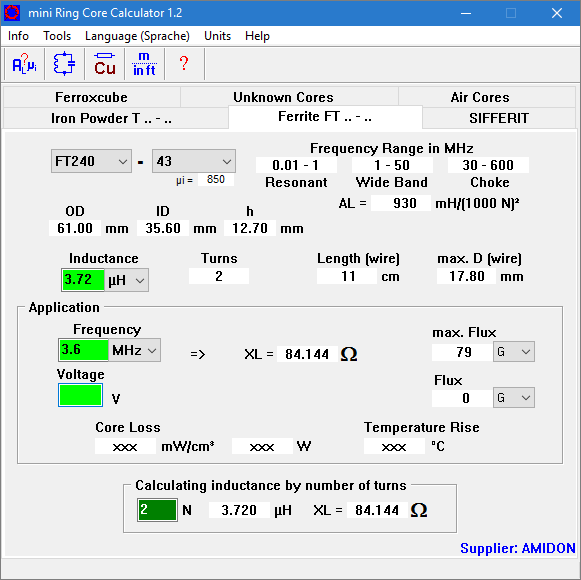 toroids.info is a very popular online calculator for toroidal ferrite cored inductors. Above is the toroids.info results based on Al=1075nH (they often have incorrect Al values). They give Z (ohms) as the scalar value 97.3Ω, and the naive would assume that Z=0+j97.3Ω, but is the R component really zero? 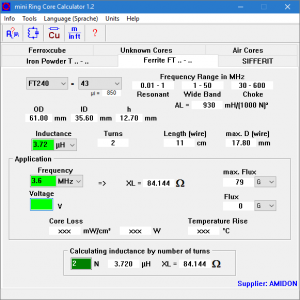 Above is the popular Mini ring core calculator v1.2. First thing to note is that it gives Al as 930nH (for 1t), which is 13.5% lower than manufacturer Fair-rite gives for their cores, so we expect incorrect results. This gives Xl=84.144Ω with no mention of R.
Above, the calculator results include Z and Y, both as complex numbers that include the effect of core loss. Let’s make a measurement of impedance of a core with two turn winding. Above is a plot using an AIMuhf. Due to experience that has undermined confidence in this system, I have checked the results on a Rigexpert AA-600 and they are acceptably close. 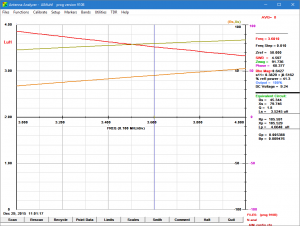 The figures on the right hand side give the spot values at 3.6MHz. Dismiss the calculators that do not give complex impedance with non-zero R, they are toys that are not suited to RF ferrite cored inductors. The sample core has measured Z that is significantly higher than predicted by the owenduffy.net calculator, measured R is 45.3 vs 27.4 (+65%), and measured X is 79.7 vs 57.4 (+39%). This difference highlights an important dimension of designing with ferrites. Can we rewrite the books about FT240-43 based on measurement of a single sample? Certainly not, that cannot possibly capture the nature of a product that is actually highly variable. There are a host of methods of characterising an inductor, and various forms of LCR meter are very popular with hams. The problem is that they usually make measurements at a low and often unknown frequency which is of little use in characterising a ferrite cored inductor at RF. Q meters, RF impedance and admittance bridges may provide valid measurements, but the modern two port VNA or quality antenna analyser can provide sufficient accuracy for a wide range of practical inductors. The design process often calls for choosing some key parameters of a component, and in the case of N4SPP’s transformer, one of the rules of thumb (RoT) is that number of turns is chosen so that Xl is greater than 50Ω. Such a RoT will become evident as ROT as we go on. Assuming that the loaded transformer input impedance= 50+j0Ω, characterising the transformer two turn primary as a complex impedance or admittance allows us to calculate the percentage of power lost in magnetising the core. We have two sets of data, one representing average core characteristics from the manufacturer and one from measurement of a single core. Lets calculate the percentage core loss of both. 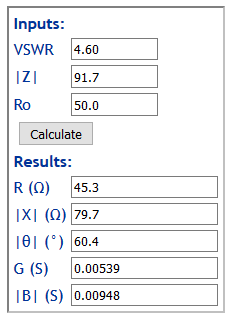 Just to recap, if the input Zin of the loaded transformer with VSWR=1 is 50+j0Ω, input Yin=1/Zin=0.02S, Gin=0.02S. Measurement of the actual core gives insight into the performance of a single core, the DUT. 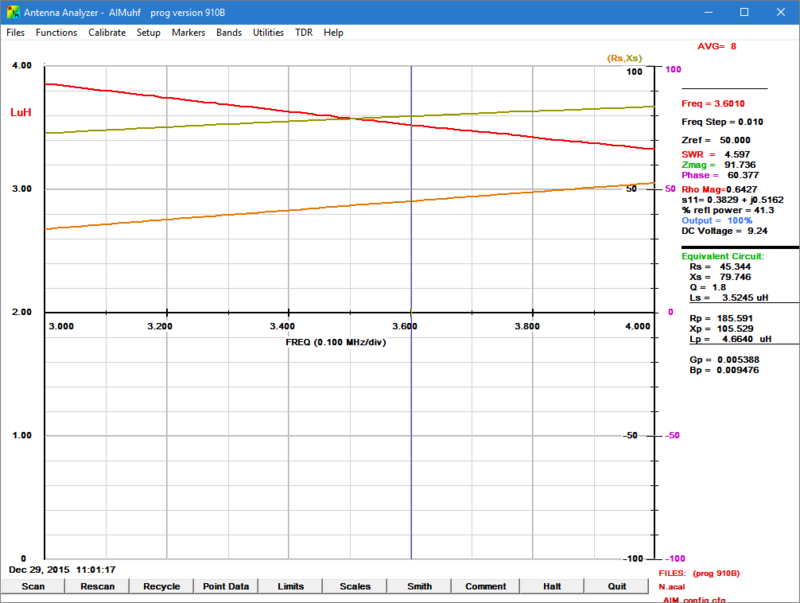 From the AIMuhf results, Gcore=0.005388S. Note that these figures apply to the actual core measured. The best estimate of N4SPP’s core, or any you might buy is the manufacturer’s data (calculated below). 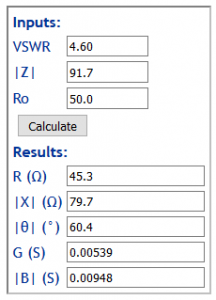 Using the calculator Find R,|X| from VSWR,|Z|,Ro, we can find R and |X|, and more conveniently, G and |B|. Above, the value of G at 0.00539 agrees with that directly from the AIMuhf report. A significant issue is that the precision and accuracy of many of the low end devices is poorer, and the limits of Z that provide acceptable accuracy are narrower. However, this example was chosen to be in range of most analysers, you can try a similar measurement to reinforce what you have read. The manufacturer’s data should be based around measurement of a number of cores, and reduction of those measurements to an average value and some variance or tolerance. This data is more relevant to design for replication. From the owenduffy.net calculator above, Ycore=0.00677-j0.0142S, Gcore=0.00677S.